My friend Marion was the first member of my Recipe Club, and she sent in a recipe for char-grilled fennel, zucchini and onion rice. This recipe below was heavily inspired by it -- a delicious, colourful meal in a bowl! Since I was short on time, I sauteed the vegetables but they are lovely grilled or roasted. Wash the rice then cook in a saucepan with 2 cups filtered water, covered, until done, about 35 minutes. Meanwhile, prepare the vegetables. If grilling on the barbecue, toss in olive oil, grill, then chop into bite-sized pieces. If sauteing, chop raw vegetables into bite-sized pieces and stir fry separately in 1 Tbsp olive oil each batch. If roasting, toss large or small chopped pieces in olive oil and roast until cooked and slightly charred. Stir once or twice to prevent sticking or burning. In a small bowl, combine the garlic, lemon zest, lemon juice, olive oil, cumin, pepper, and salt or Bragg. When the vegetables are cooked, place the rice in a large bowl and top with veggies. Season with salt and pepper, add parsley and tomatoes, then pour on the dressing. Gently stir everything together with a large spoon or salad tongs. 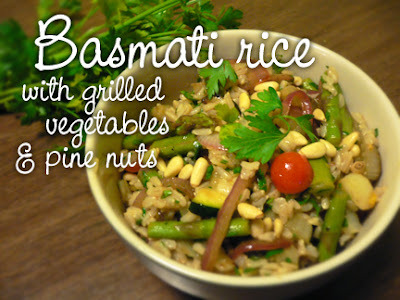 Taste and adjust seasonings, and serve hot, warm or at room temperature, topped with pine nuts. Serves 4. One of my favorite stand-by dishes. so good! Absolutely delicious Indigo Extra Long Grain Basmati rice,classic recipe..looks divine. Taste the combined benefits of convenience, health and variety - only with Bhandari Foods'' Ready-To-Eat range.Our range of products cover wide range of delicious recipes, to give you a taste of food which taste just like fresh home cooked food. It is your ready help in kitchen for authentic taste, variety of choices in different cuisines and high on convenience. Each item on our Ready-To-Eat menu is natural, preservative-free and 100% vegetarian. Our technology also ensures that each item delivers that 'just-cooked' freshness straight on your plate!